Not sure about you but I am totally holding on to summer! 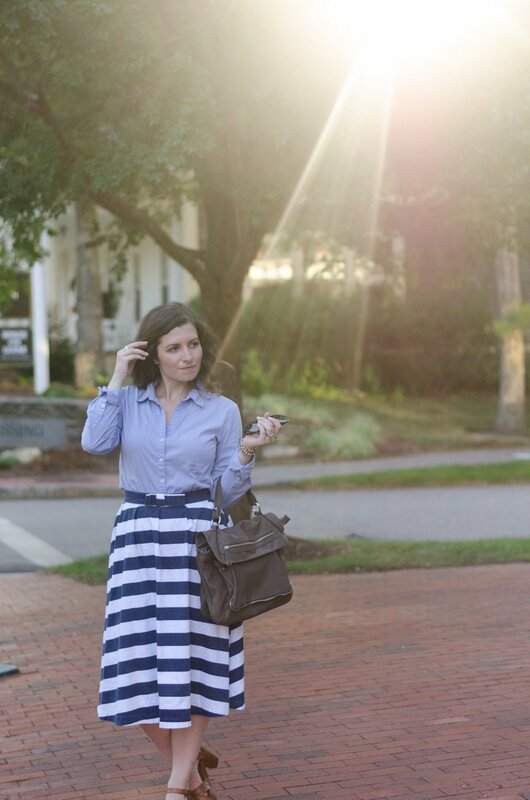 I am crushing on this skirt from Shabby Apple . 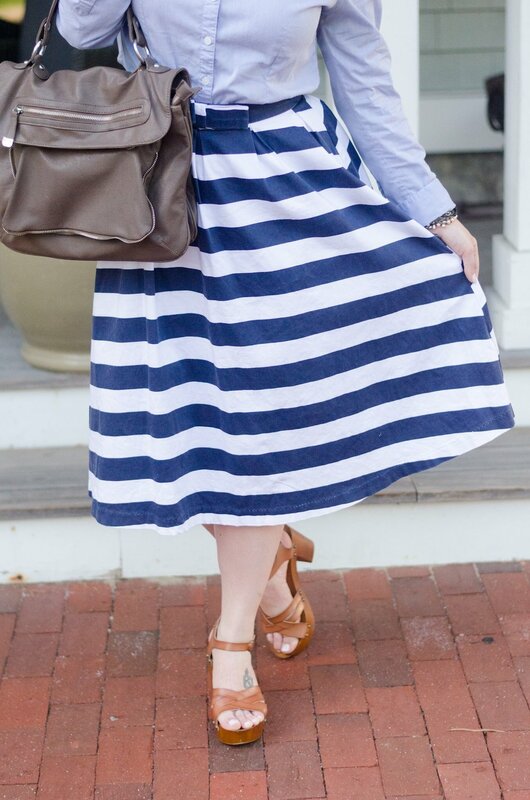 This navy striped number exudes nautical vibes. If you have been following along you may remember my post on pattern play. I had mentioned that stripes are a great place to start! Stripes can be paired with animal or floral prints. I kept it simple in this look with a chambray button down & chestnut block heels. We don't have many days of summer left (especially if you live in New England like me) grab a hold of them & get all the fabulous summer looks you can get in! If you are single, fear not! Sometimes taking a style note from the guys isn't a bad thing. The boyfriend trend has been around for some time. Now I am not saying to go shopping in the men's department (but I am not going to stop you either). What is the boyfriend look? It is a bit more of a relaxed, looser, boxier fit. Shown is a longer more boxier boyfriend blazer with a feminine twist which is the animal print roll cuff. The jeans are also a more relaxed boyfriend fit feminized with heels. The key to pulling off the "boyfriend" look is to always add a hint of feminism. I balanced this look with this awesome bow bag. This is a really simple way to put together a chic outfit. Give it a try for yourself, you won't regret it! Happy Styling! Typically, when searching for wardrobe staples the key is to purchase neutral colors, this allows for versatility. There are a plethora of different styles blazers available to you. You may find a blazer that will fit perfect throughout the torso but, the sleeves are too long. Buy it and get the sleeves hemmed. I always tell my clients that ready to wear(buying off the rack) is always almost ready to wear. Meaning, manufacturers cut clothing to different specifications so, if you find a piece you love and fits you perfect for the exception of one spot, buy that item and take it to a seamstress. Well dolls I hope this has inspired you to go out and find your special blazer. This jacket will add instant sophistication to your wardrobe. As illustrated blazers can be accessorized for any occasion, you will definitely get your moneys worth.